Qigong Journey to Emei Mountain with Teacher Ivy, April 2017 - Register NOW! Some students have expressed interest in doing a Qigong Journey to Emei Mountain and asked me to do one. So, this is it. Please arrange your own flights to Chengdu. Silkair flies to Chengdu direct from Singapore, the current fare is about S$700. This is a free and easy Qigong Journey to Chengdu and Emei Mountain, we will try to do at least one session of Qigong practice outdoor everyday during this journey. I say “try” because it's cold on Emei Mountain in April. The daytime highest is 8C and nighttime lowest is 0C. Humidity is low, so we'll have clear sky and better views on the Golden Top. April is also the flower blooming season on Emei Mountain, you'll see Rhododendron 杜鹃花 blooming everywhere on the mountain. We can spend a few days in Chengdu, visit the famous Poets Park, Confucian Temple, Manjushri Temple and do day trips to Panda Bear Conservation Park. 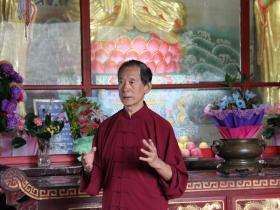 April 8 – 9: In Chengdu, qigong classes in the morning, Free&Easy after lunch. April 12: Morning qigong, continue hiking up to the top of Emei Mountain, stay overnight at Golden Top. April 13: View sunrise at the Golden Top, and start our descend to the bottom of Emei Mountain. The trip can be shorten by 1-2 days. If you are interested in doing this trip, please SMS/whatsapp Teacher Ivy at 86519850 by March 1, 2017. I will let you know on March 2 whether we have enough people to do this trip and ask you for a deposit. Then I can plan the complete itinerary and give you the details. Venue : Ang Mo Kio Park Opposite AMK Library, between Ave 3 & Ave 6. Meet at the top of the hill. Venue : Aljunied Neighbourhood Link Center, near Aljunied MRT station Blk 98 Aljunied Crescent. We had a successful workshop with Grandmaster Fu in August, 2016 and he taught the Micro-Training for Specific Organs to a group of 14 students. We hope you find these practices valuable and try them out or share with people who have specifc organs-related illness. We did a seven day Chan meditation retreat with Emei Qigong 13th Lineage Holder, Grandmaster Fu Wei Zhong, in Emei Mountain last September. Here are some of the photos. Check out our photo gallery for all the photos! Copyright © 2016 Wisdom Center LLP. All rights reserved.